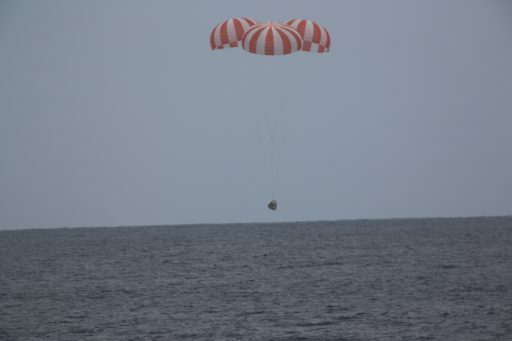 SpaceX’s Dragon C108.2 spacecraft departed the International Space Station after a month-long stay on Saturday via the first-ever ground-controlled release of a visiting vehicle, sending the spacecraft on a five-and-a-half hour home-bound journey culminating with a parachute-assisted splashdown landing in the Pacific Ocean to return valuable science benefiting life on and off the Earth. Supporting SpaceX’s 13th operational logistics mission, Dragon was detached from the International Space Station on Friday after facilitating the delivery of world-class science and two new external instruments and picking up a return shipment of samples and various performed experiments eagerly awaited at laboratories across the U.S. Dragon was released at 9:58 UTC on Saturday through commanding sent from controllers on the ground in an effort to streamline future ISS visiting vehicle operations and reduce crew time requirements. Set free after a stay of over 26 days, Dragon fired its thrusters to depart the vicinity of the orbiting laboratory and head off on five hours of free flight ahead of a rocket-powered braking maneuver to transition the spacecraft from an orbital path onto a downward arc to intercept the dense atmosphere for a blazing re-entry. Landing in the Pacific Ocean, some 625 Kilometers west of Baja California, was confirmed at 15:36 UTC. The Dragon SpX-13 mission started on December 15 with the first launch of a flight-proven Dragon spacecraft on a previously-flown Falcon 9 booster after NASA worked through reviews of SpaceX’s spacecraft and launch vehicle re-use operations and agreed to Dragon re-flights for the remainder of the CRS-1 program while also permitting SpaceX to employ once-flown Falcon 9 first stages for Dragon launches. 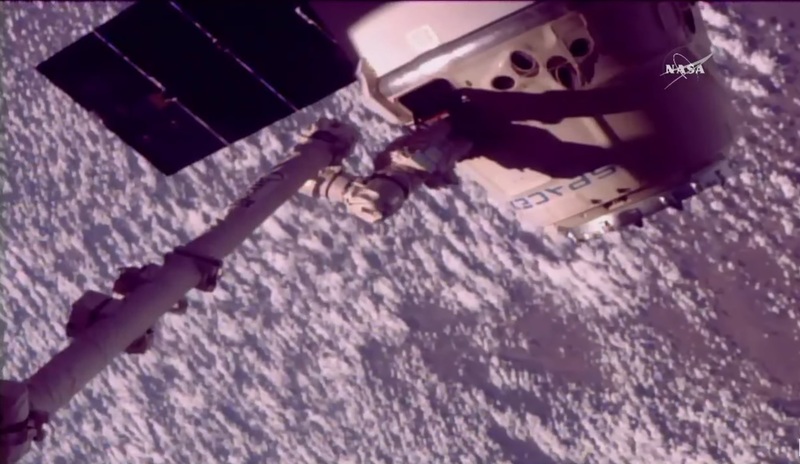 Enjoying a smooth boost into orbit, Dragon arrived at the Station two days after launch for a robotic capture and berthing to the Earth-facing port on the Station’s Harmony module. 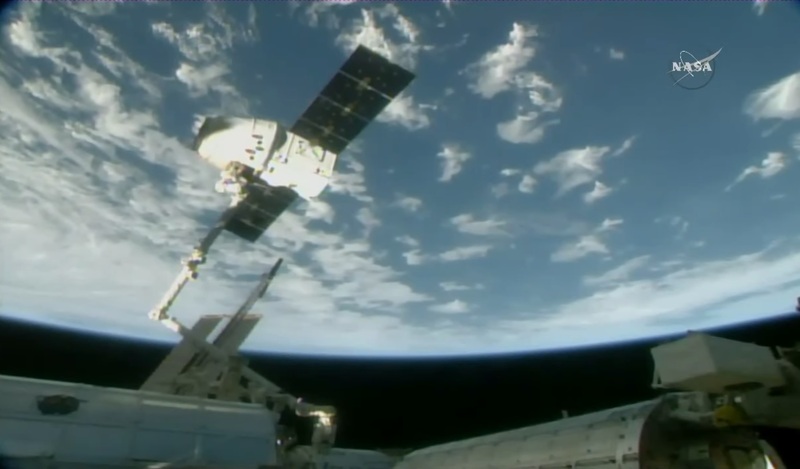 Over the course of its four-week docked stay, Dragon was unloaded by the ISS crew that had a busy schedule dealing with the transfer of 1,560 Kilograms of pressurized cargo and a series of experiments that traveled up on Dragon and had to be completed in time for its departure to ride back to Earth on the same spacecraft. Outside the Station, the Canadarm2 robotic arm and Dextre robot completed the installation of the two external payloads delivered via Dragon’s external Trunk Section. Dragon delivered to ISS the Total Irradiance and Spectral Sensor (TSIS), considered a critical climate science instrument to continue a data record of solar energy input to Earth that has been uninterrupted since 1978. 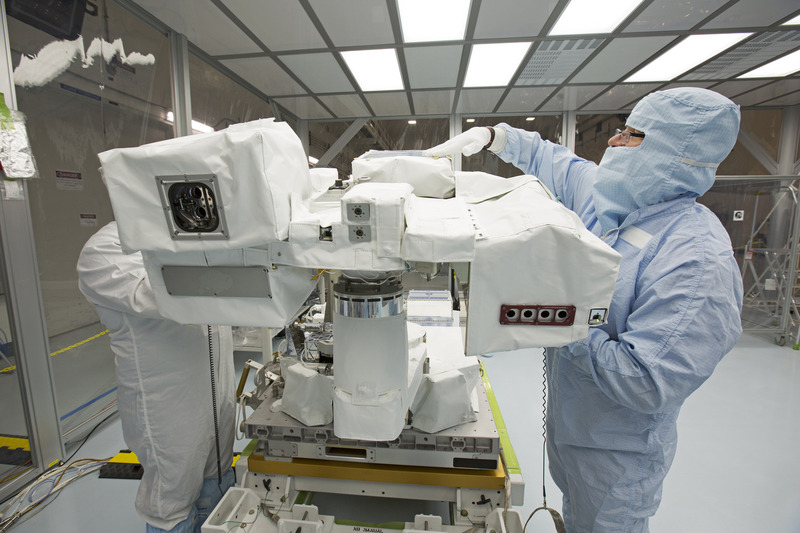 TSIS has taken up residence on the Station’s Express Logistics Carrier 3 while the second trunk payload, the Space Debris Sensor, was installed in a forward-pointing direction on ESA’s Columbus module to face the direction of incoming orbital debris for a study of the population of micro-sized debris objects in Low Earth Orbit. 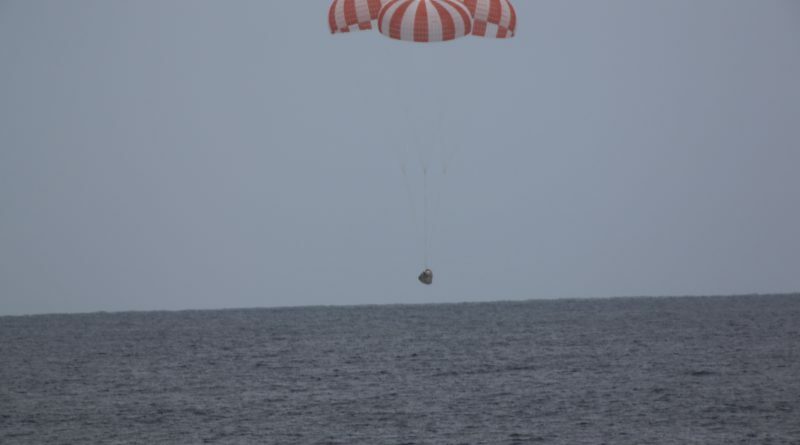 For its return to Earth, Dragon was loaded with 1,850 Kilograms of cargo comprising 108kg of crew supplies and personal effects of past crews, 321kg of spacewalk equipment for refurbishment on the ground, 281kg of vehicle hardware for inspections, refurbishment & disposal, 16kg of computer resources and 913 Kilograms of science investigations in the form of samples packed into powered laboratory freezers & double cold bags and various performed experiments awaited on the ground for post-flight analysis. Bolted into the Trunk Section for a fiery disposal was the ISS RapidScat payload that measured winds over Earth’s oceans between September 2014 and August 2016. Also set for a ride home on Dragon was a group of 20 mice, supported by a basic life support system comprising a LiOH carbon dioxide scrubber installed inside the Dragon to ensure the Mousetronauts make it back safe and sound to undergo a post-flight study looking into the ability of a novel drug to slow and/or reverse muscle atrophy in astronauts undergoing long-duration space flight and Earth-bound patients with muscle-wasting diseases. The second group of mice will continue their stint on ISS for another four weeks on a mission without return ticket. 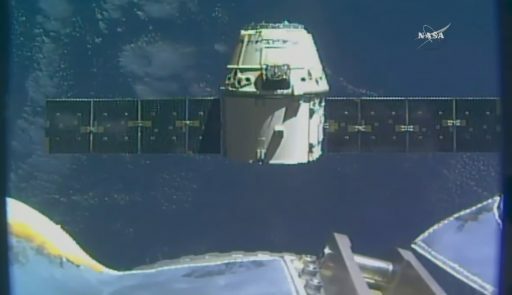 Dragon’s second tenure on ISS ended late on Friday (UTC) when the spacecraft was unberthed from Harmony by releasing sixteen structural bolts to hand control of the vehicle to the 18-meter long Canadarm2 that then positioned it for release, placing it around ten meters below the modules of ISS. 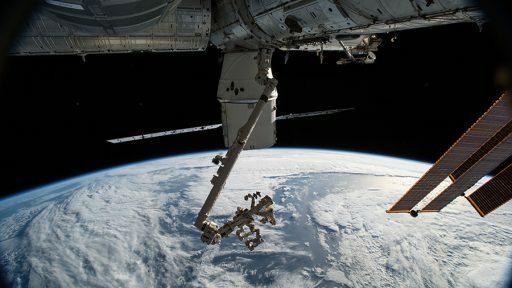 The first ground-controlled release of an ISS visiting vehicle had been in the works for over five months via development of robotic commands and backup procedures. 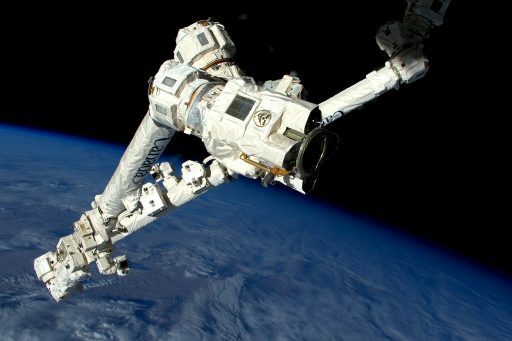 Ever since its launch to ISS in 2001, the role of the Space Station’s Canadarm2 – along with its robotic colleague Dextre – grew in importance: first playing a major part in the assembly of ISS before taking on the job of capturing and releasing U.S. and Japanese resupply vehicles and dealing with complex maintenance tasks on the exterior of the complex. Initially, it fell to the ISS crew members to control the Station’s robots from inside the ISS – first only via video screens and later with an out-the-window view through the Cupola module. As the concept of robotics matured, more and more tasks were shifted from the crew to ground operators – freeing up valuable crew time for research. For visiting vehicles specifically, this meant precious crew time would no longer be taken up by the multi-hour process of berthing/unberthing cargo vehicles which is now handled routinely by ground controllers. However, capture and release had been left in the hands of the crew given their better situational awareness via a real-time, out-the-window view and ability to quickly react to changing conditions. Managing the release of vehicles from the ground could allow the crew contingent present for a vehicle departure to be reduced from two crew members (one operating the robotics workstation and one monitoring/commanding the spacecraft) to only one crew member in a backup role for the robotics and tasked with commanding of the spacecraft. 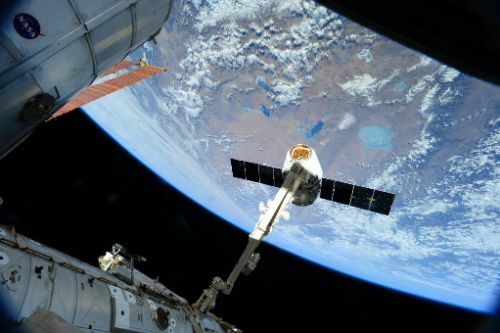 Saturday’s Dragon release was handled by controllers at the Canadian Space Agency’s Saint Hubert facility with a direct line of communications from the ROBO team to the ISS crew. Commands were sent to open the snares within the Latching End Effector of Canadarm2 at 9:58 UTC and, once the LEE was clear of the grapple pin on Dragon, the arm was backed away by remote command to a safe distance of 4.5 meters. 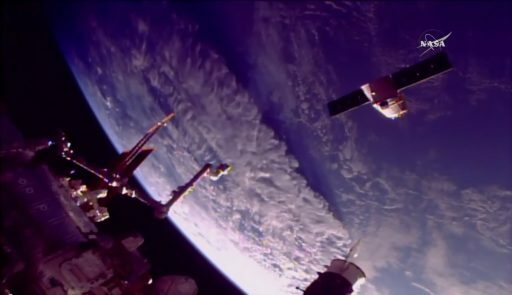 Dragon was commanded into its departure sequence three minutes after release with an initial departure burn of eight seconds followed after one minute by a slightly larger maneuver to accelerate the spacecraft down the radial vector to depart the ISS Keep Out Sphere. The third and largest departure burn, around ten minutes after release, set Dragon on its course away from ISS to open a sufficient gap for the deorbit burn. 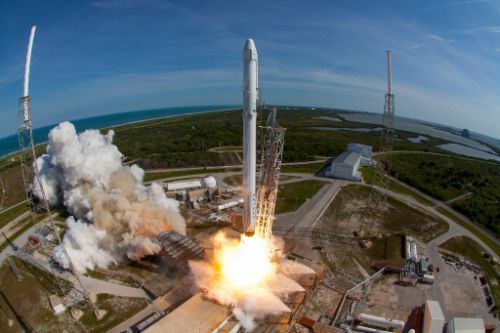 At 14:43 UTC, Dragon fired up its Draco thrusters for a ten-minute braking maneuver to slow the craft by around 100 meters per second to drop out of orbit. Four minutes before hitting the atmosphere, Dragon jettisoned the expendable Trunk Section which is not outfitted with a thermal protection system and burns up on re-entry along with the disposal payloads it contains. Encountering the dense atmosphere, Dragon’s PICA-X heat shield – which is replacement between missions – had to endure temperatures up to 1,600 degrees Celsius and Dragon constantly modified its lift to optimize the flight path toward the planned parachute opening target – having shown good accuracy since its very first landing from an ISS mission. 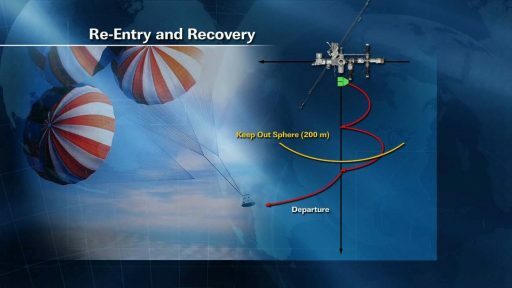 Friction in the atmosphere slowed Dragon to a subsonic speed of 240 meters per second at which point two drogue chutes deployed some 13.7 Kilometers in altitude to further reduce the vehicle’s speed for the deployment of the three large main chutes. Splashdown was expected 625 Kilometers south-west of the Californian Coast where recovery forces were awaiting the arrival of the vehicle. Landing on-target and on-time, the SpX-13 mission clocked out at a duration of 29 days on the dot, bringing this spacecraft’s total time spent in space to 66 days after spending nearly 37 days in orbit on the sixth CRS mission performed by SpaceX in 2015. Dragon’s landing started the typical race against the clock to ensure time-critical payloads make it to NASA within 48 hours of touchdown. Loaded onto a ship, Dragon will be transported to the Port of Long Beach where time critical items are removed and shipped to their home institutions while Dragon continues by road to SpaceX’s McGregor test site in Texas where the remaining cargo items will be removed followed by post-flight safing of the spacecraft.